I understand that baseball is the national pastime so someone probably thought it was cute to equate most leisure activities to pastimes for the 1987 Topps set, but scuba diving? A pastime? How is that possible? I mean the majority of equipment required for scuba diving are generally more modern inventions. Now, carpentry, that’s truly timeless. People been building stuff with wood and whatnot since opposable thumbs. Searage’s career wasn’t exactly timeless. He was drafted in 1976 and wouldn’t make the majors until 1981 at 26 with the New York Mets. He pitched 36.2 innings and posted a 3.68 ERA and 1.39 WHIP. Not bad, eh? Well, he had a 0.94 K:BB rate, yikes. Still, he finished the year 1-0 and went 1/1 at the plate. The Mets traded Searage to Cleveland in 1982 for Tom Veryzer. 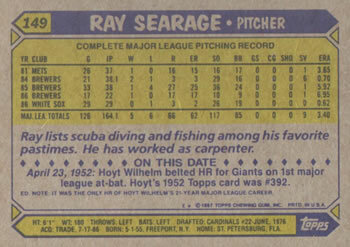 This made Searage the only Met in history to have a spotless record and 1.000 batting average. 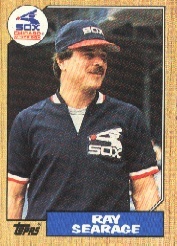 After 1981, Searage would toil in the minors, not reaching the majors again until 1984. He was now 29 and pitching for Milwaukee. He again had success (0.70 ERA and 0.94 WHIP) in limited innings (38.1). However, his success wouldn’t continue, as in the same basic amount of innings, Searage had a 5.92 ERA and 1.05 WHIP the following season. He performed similarly poorly in 1986, so the Brewers traded him to the White Sox for Tom Hartley and Al Jones. He pitched well for the White Sox to wind down 1986, but showed very little in 1987. He was out of baseball in 1988, but came back in 1989 with the Dodgers at 34. He pitched two season and 69 innings for the Dodgers, finishing with a 3.18 ERA and 1.28 WHIP for the club. He called it quits after 1990, arguably his best year. With all the shuttles from the minors to the majors, it was good Searage could find work as a carpenter, maybe he even worked on erecting billboards in minor league parks. Anyway, I think he’s moved on to better pastures. And we also got more facts about Hoyt Wilhelm with this one!